At AirZone HVAC Services, we want our clients to experience total indoor comfort. For someone with allergies, if the air they are breathing is full of irritants they will not be comfortable. We carry an array of different solutions to ensure that your air is clean to breathe when you are at home. The easiest and most affordable solution to cleaning your air is to install a larger filter cabinet with a larger filter. This results in more particulates and other irritants being removed from the air circulation resulting in cleaner air. Although there are several factors to consider when choosing a filtration system, common concerns for people are allergens. The more sensitive a person is to allergens, the greater the need for a high-efficiency filtration system. We carry in stock a 5 inch filter that offers a great balance of cost, efficiency, and longevity. And of course this filter delivers comfortable air throughout your home. Efficiency of a filtration system is based on the size of the particles captured by an air filter. The filter’s MERV (Minimum Efficiency Reporting Value) number is an industry standard for rating filters. 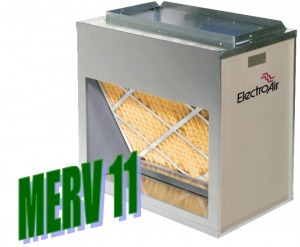 Residential filters typically have an MERV range of one to 12. Higher ratings indicate a more efficient filter. Higher filter efficiency helps clear the air and improve airflow. Cost is a factor to consider when purchasing a filter. Although a high quality air filter may cost more initially, it can actually save you money over the long term. Inexpensive filters provide poor filtration thus requiring more frequent filter replacement, and are often left unchanged resulting in reduction in efficiency and possible damage to your system. A common question we receive is how often your should change the filters in your HVAC system. This greatly depends on your home usage and type (and size) of the filter. As a general rule, your should change your air conditioner filter every 1 month. This is especially important for less expensive filters that become clogged quickly. Furnace filters should also be changed every month unless you are using a high performance 5 inch filter. We recommend that 5″ filters be changed every three to six (3 to 6) months to ensure proper performance. For homes with pets, regular furnace and air conditioner filter replacement is extremely important! A clogged filter will result in reduced indoor air quality and put strain on your heating and cooling system. Dirty filters restrict airflow which also causes your furnace and air conditioner to work harder to push air resulting in reduced equipment lifespan and higher utility bills.